Easily generate project style calendar plans, from a task list and associated details. The SIMPLEST edition, just ONE button to use! just fill in the values in the Input Cells and press the "Run" button. BONUS OFFER: With the purchase of this calendar, the Microsoft Excel templates for the Yearly and Monthly calendars are offered (worth $2.95 each)! Get a simple Daily, Weekly, Monthly and Yearly solution! 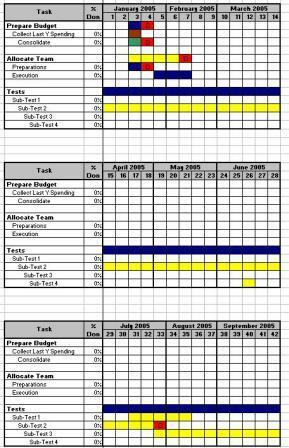 This easy to use Microsoft® Excel macro will generate pretty calendar plans in minutes. No need to learn new software skills. Get your Plan Generator now by using one of the BUY NOW buttons on this page. 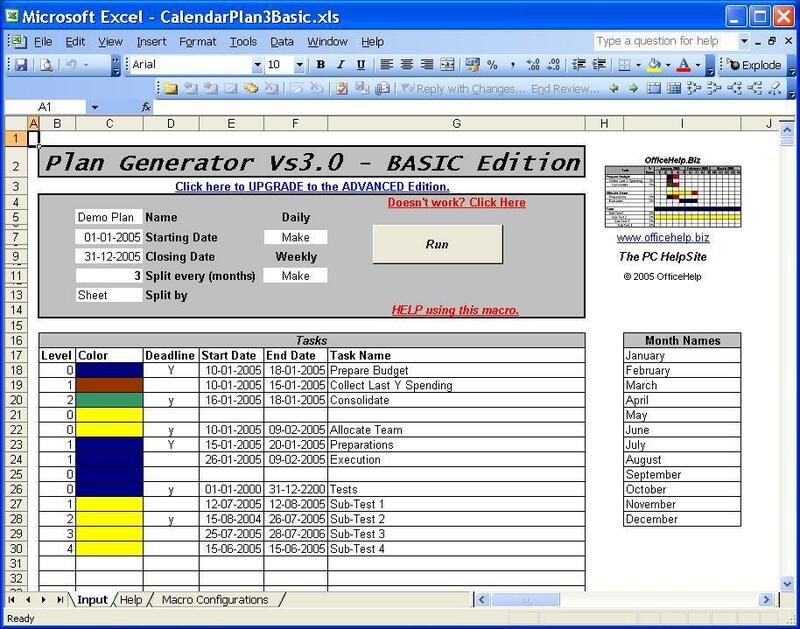 After payment at PayPal, you will get to a confirmation page with a link to download a ZIP file containing 3 Microsoft® Excel files (CalendarPlan3.xls as the Macro, MonthPlan.xls and YearPlan.xls as the bonus templates). Click on this link and save the file to your own hard drive. You will need to unzip it (extract the Microsoft® Excel files from the compressed ZIP file). Windows XP will let you do it directly, presenting the file as folder. On older versions of Windows, you will need an extra application like the popular WinZip. 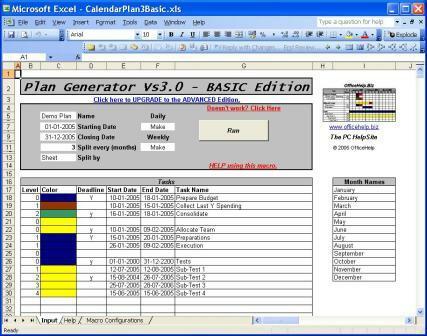 Once extracted from the ZIP file, just open them with Microsoft® Excel every time you want to use it. The DEMO version of some other of our products may also be included. Consultant? Developer? Corporate IT? Get the Source Code! Supply your clients with your own version of our calendar software!!! Rebrand messages and interface with YOUR logos and trademarks! Add missing features or adjust existing ones to your clients special needs. Supply it as your own product. Full access to the Macro source code. If you know Excel VBA you should have no problems understanding this macro. Check the licensing terms.